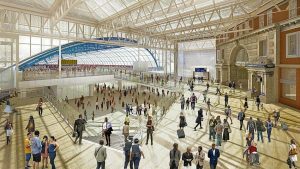 RAIL passengers are being asked to plan well ahead for major changes at Waterloo during August next year. On Thursday last week, Network Rail and South West Trains launched a campaign asking travellers to plan ahead for major changes taking place at London’s Waterloo Station between 5 and 28 August 2017, as they continue to deliver an £800 million upgrade to the railway, and the biggest investment in the London station for 80 years. Journeys on lines into Waterloo have more than doubled, from 108 million in 1996 to 234 million today, and the Waterloo & South West Upgrade promises more seats, longer trains and a bigger, better Waterloo. To ease overcrowding, the plans are to bring the five platforms of the former international terminal back into use; extend platforms 1 to 4 to accommodate 10-car trains, and introduce 10-car trains between Waterloo and Reading. Christian Roth, Managing Director at South West Trains, said: “The Waterloo & South West Upgrade is the biggest investment in this railway for decades and will provide more trains, more seats and more space for tens of thousands of passengers every day. An indication of how the changes will impact on Woking commuters can be found online at networkrail.co.uk/wswupgrade and www.southwesttrains.co.uk/wswupgrade. A revised timetable and more detailed advice for passengers will be published early in the New Year.